You are here: Home / Organization / What Does Your Desk Look Like? I typically have to move books or papers off of a chair to clear a space for potential clients to sit down. There are at least 2 stacks of paper on my desk that resemble the Leaning Tower of Pisa. I’m not exactly sure if my desk is wooden or metal. My computer monitor is outlined with bright pink Post-it notes reminding me of important meetings. My desk calendar is blank (from what I can see). My idea of filing is chronological. That is, I simply keep all papers in the order they land on my desk. I typically plop my lunch plate down anywhere I can find a spot. This usually means on top of a client’s folder. Coworkers have trouble seeing me through the piles of paper on my desk. Maintenance has hung up a “Caution: Falling Stacks. Hard Hats Required” sign outside my cubicle. Surveys find that at least one hour is lost by each employee each day due to disorganization/clutter. In the chart below, you will note how much a $10 per hour employee costs a company (with 1,000 employees) each year in lost productivity due to clutter. Albert Einstein said “If a cluttered desk is that of a cluttered mind, of what, then, is an empty desk?” Translation: You don’t necessarily have to have one pen, one computer, and one telephone neatly lined up on your desk to effectively complete your daily tasks. However, an overly cluttered desk is directly correlated with decreased productivity. Therefore, you need to create a work space that works for you. Remember, each employee functions in a unique way. The system that works for one, may not work for another. As soon as a paper reaches your desk make a decision (similar to email): Use, store, or throw away. Better yet, recycle. If you must store the paper, do so in an organized manner. Perhaps your company has a storage room filled with filing cabinets. At the end of each day, take the papers that need filed and file them. Don’t let them pile up all week. If you must keep the papers on your desk for current use, create organized piles. While you want to avoid creating the Leaning Tower of Pisa, you can still stack papers up in an organized manner. Consider purchasing a vertical filing system that can be placed on your desk or hung on the wall. Color code the vertical filing system. Use red tabs for “Priority” work. Orange tabs for work that needs done soon. And yellow tabs for work that can be completed anytime. The idea here is that when someone asks you for the paper, you can quickly grab it from the area it is stored. Therefore, know your system and stick to it. If each paper is where is should be, you won’t waste valuable time searching. Put books on a bookshelf. If you are using them for a project, clear a small spot on your desk. Otherwise, they should always be stored on the shelf. Sort papers/mail as it comes in. Avoid letting papers, memos, documents, and unopened mail pile up. Follow the use, store, or toss system. Purchase a small space saving organizer that will hold all of your pens, pencils, highlighters, stapler, etc. Keep all of these implements in the organizer. You will be surprised how much space is saved. Research and purchase office organizers that will work with an individual’s needs. Get a smaller desk. With less space for things to pile up, you will stay more organized. Purchase a paper scanner. They are thin and small enough to sit right at the edge of your desk. You can quickly create digital copies of documents, paperwork, memos, receipts, etc. You can then recycle, shred, or throw away the hard copy, eliminating storage. If you’re the person with the pink Post-it note fetish, you may need to create a more efficient scheduling system. If someone calls and you write down their appointment on a Post-it note to be stuck somewhere, how can you be sure it won’t get lost? If you depend on Post-it notes to serve as a calendar, chances are you’ve missed appointments or deadlines. Instead purchase a desk/wall calendar and actually use it. If you prefer digital, create a calendar through your email. You can schedule appointments, tasks, and deadlines. You will also receive email reminders that will ensure you are always on top of things. If you do not want your client based email account to fill up with email reminders, create a special account simply for calendar reminders. You can check it every morning. 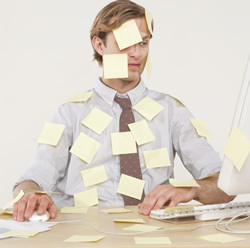 Post-it notes can be used for minor tasks throughout the day. However, at the end of the day throw away outdated notes. Don’t keep notes from last month sticking around. A cluttered desk doesn’t just affect your performance, it also has an effect on your career. In a study conducted by Iogear Study, 73% of the 138 polled said that their impressions of coworkers are influenced by their desk/work space appearance. Nearly 70% believed that workers with a messy desk were less career driven. Because you are responsible for important documents, memos, scheduling, deadlines, and tasks, organization is the key to efficiency. Take the time to de-clutter and organize your work space. However, don’t stop there. Make sure that you create a system that can realistically follow every day. Don’t plan on de-cluttering once a month. This is rather inefficient. Instead, create a system that works for you and stick with it. 700,000 to 1.4 million Americans may have compulsive disorder syndrome—difficulty in throwing away anything for fear that they may need the items later (Self Storage Association: Obsessive Compulsive Foundation). Employees lose one hour of productivity (on average) to clutter/disorganization each day (National Association of Professional Organizers). The average office worker spends 36 minutes/day looking for misplaced papers (Priority Management Systems). The average American spends one year of their life looking for lost or misplaced items at home and in the office (U.S. News and World Report). Paperwork has been voted the biggest burden for small businesses. 80% of papers that are filed are never referenced again (National Association of Professional Organizers). It costs nearly $25,000 to fill up a four drawer filing cabinet. It also costs $2,100 each year to maintain it (Gartner Group).